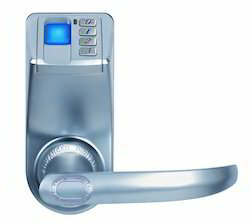 Supports 120 user finger prints, one pin user, Stand alone lock set, no wires to mess with, Ready to go out of the box, easy installation, comes complete with Fingerprint Door Lock instructions and positioning template, Toggle capability between auto-lock or open state (passage) mode, One (1) year manufacturer's warranty for replacement or repair. A Biometric Locks fingerprint reader is a more reliable security device than your average lock or keypad. Only the person authorized access can successfully pass a biometric reader. A key, card, or number sequence can be passed around or easily stolen. A biometric reader requires that the authorized person be physically present for access to be granted. Thieves and other criminals would have a difficult time getting past a biometric reader. Bring your security into the twenty-first century with the cutting-edge technology of an Robo Touch biometric locks. Robo 242 (Fingerprint Mifare card 4-button Key) Supports 120 user finger prints, 120 Mifare card users and one pin user, Stand alone lockset, no wires to mess with, ready to go out of the box, easy installation, comes complete with instructions and positioning template, Methods of entry: Fingerprint, Mifare card, Pin number only, or Key-override, 360° position rotational-free sensor, PVD coated optical sensor for long life, Latch bolt includes deadlocking plunger bolt for additional security, Toggle capability between auto-lock or open state (passage) mode, Heavy duty cast-steel constructed. 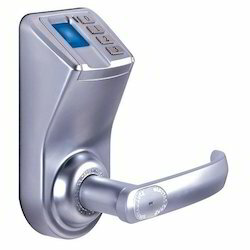 A Biometric Door Locks fingerprint reader is a more reliable security device than your average lock or keypad. Only the person authorized access can successfully pass a biometric reader. A key, card, or number sequence can be passed around or easily stolen. A biometric reader requires that the authorized person be physically present for access to be granted. Thieves and other criminals would have a difficult time getting past a biometric reader. Bring your security into the twenty-first century with the cutting-edge technology of an Robo Touch biometric locks.Robo 121 (Finger print 4 button Key) Supports 120 user finger prints, one pin user, Stand alone lock set, no wires to mess with, Ready to go out of the box, easy installation, comes complete with instructions and positioning template, Toggle capability between auto-lock or open state (passage) mode, One (1) year manufacturer's warranty for replacement or repair. 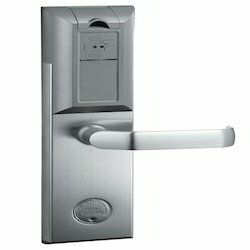 Looking for Finger Print Door Locks ?